Many associate the Panoz brand with Don Panoz and his racing. Fewer know that it was actually Don’s son Dan, that had the interest in cars and building them and founded Panoz in 1989. 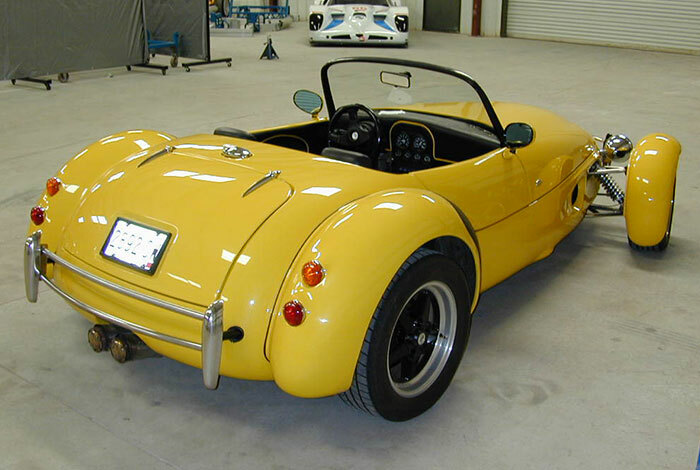 Dan started in 1986 by importing the 1986 AC Cobra MK IV manufactured by Autokraft into the United States. These were built from the original tooling for the 427 Cobra but updated to modern standards with current era V8 and applicable US safety standards and wrapped with a hand rolled aluminum body. By 1988, Dan was approaching several small volume vehicle manufacturers in Europe looking for opportunities for manufacturing back in the States. One of the companies was the Thomson Motor Company (TMC) located in Wexford Ireland. TMC however, was going into receivership so Dan seized the opportunity to buy the rights to TMC Costin. The chassis was designed by world-renowned designer, Frank Costin. Frank had previously designed chassis for Maserati, Lotus and Lister, as well as significant cutting edge automotive aero work. The TMC as a car was a very capable elemental 2 place road going sports car with incredible balance and grip. It was also a capable race car, winning 21 out of 22 consecutive races in its class. It was also just plain ugly – competent but ungainly. After concluding the deal, Dan brought drawings, chassis jigs / fixtures and two complete sets of car parts back to the United States. The shop was set up in an old 3000 sq.ft DOT salt storage facility. Dan also brought back Mick Murphy, the head fabricator and Sean Thompson one of the TMC engineers, and set about the task of manufacturing in the U.S. This was in January, 1989. Dan’s plan could simply be titled Cut and Run: Cut out elements that don’t work and Run with the elements that do. Cut included the body, the small displacement drivetrain and the overly cramped cockpit. Run included the basic suspension and chassis and fit it with a drivetrain of decidedly American flavor. The most important part of the plan to do this is with what Dan calls RVP. This stands for Reliability, Value and Performance. The thinking behind this was rooted in the fact that most small volume sports car manufacturers had a horrible history of producing decidedly unreliable and difficult to service vehicles. Cool, pretty, exhilarating to drive… yes, faithful and dependable no! A large part of achieving RVP was adopting a Matched Component Policy or MCP. We would not just use an American Motor and then mate it with a bunch of other miscellaneous components as so many did. To achieve this, Dan chose to use a complete driveline. The engine, cooling system, trans assembly, clutch, rear-end uprights, brakes, steering racks, columns, pedal assemblies as well as any other components that could possibly be used for the project. All the various components were designed to work together, therefore employing them and most importantly not modifying them from their stock configuration would ensure the reliability and serviceability that Dan was looking for. The drivetrain chosen was Fords 5.0 liter V8 as configured for the Mustang which enjoyed a reputation for being bulletproof. The Ford drivetrain checked off the reliability and value parts of RVP and the new Panoz/Costin platform would allow the car to weigh over 1,200lbs less than a Mustang. At the time, the car could provide the days supercar level of acceleration and the braking could check the performance box. The big motor in a little light car formula had been used in the past, however there were elements missing in most of these configurations. Typically, the wheelbases and track widths were too short and narrow to exploit the additional power and when combined with overwhelmed original suspension systems, the handling was mostly woeful. Window-maker was a common adjective used. To correct this, the plan was to extend the wheelbase significantly. The track was widened even more than significantly. This would allow for a perfect 50/50 weight distribution. This also allowed all the drivetrain components to package comfortably within the platform. This created a front mid-engine rear wheel drive layout and achieved the much-needed interior space increase originally deemed necessary. The TMC engineer however, didn’t much care for the idea of a tweaked 1.6-liter engine being replaced with a 5.0-liter V8, and even less for any of the other heavy-duty Detroit based iron, Dan planned to fit. Nor did he like the scaling exercise to accommodate it all. Dropping him off at the airport and getting back to Braselton only took about 2 hours in those days. The Irish fabricator Mick Murphy however, thought it great crack as the Irish say, and he stayed, and Dan and Mick set about adapting all the component matched driveline to the chassis. The original TMC chassis was left alone and Dan and Mick worked on the design and build of the new chassis and suspension around 5.0 driveline in the shop. This was all before the days of CAD, so everything was done old school with hand drawings, poster board templates and a pile of steel tubes and sheet. With a chassis and driveline fitted, the next task was to dress the beast. Dan and Mick looked briefly at trying to carry over some of the TMC dress code, but a great designer once said, “You can’t polish a turd!” Dan consulted with a car magazine editor friend Mark Ewing who ran Sports Car Illustrated. He was of course skeptical but intrigued by the idea of big motors in little cars. Mark suggested we come out and visit him in LA and talk to a young auto designer who worked on his staff doing styling critiques features of other sports cars. This was quickly agreed and in late April 1989, Dan flew to Irvine California and was introduced to Freeman Thomas, a very energetic individual. When Freeman entered into his sketch and designer mode, he became so wound up he could be compared to the Tasmanian devil cartoon character. Since Dan’s chassis was light, low, wide and brutish as a result the American-Euro cross, Dan very much wanted the new body to reflect exactly that. Something that had all the right bulges and curves, confirming the big American V8 heritage, while at the same time also spoke clearly to its European roots that took no prisoners on the track due to its grip and handling ability. Another requirement that it couldn’t be confused with other open wheel sports cars on the market like a Morgan or a Lotus 7. Over the course of the many quick sketch meetings, a modern organic but retro theme was coming to life. With a base direction in place the drawing seen here was the one developed. This was locked, and agreement was made, and next steps were planned to turn the freehand sketch into reality. Back in GA in just two days, Dan and Mick buttoned up and built another duplicate chassis that would be used as a “Body Buck” to develop a full-size clay model. As soon as this was buttoned up, Mick and Dan loaded the body buck chassis and rolling drivetrain chassis and all welders torches and tools they had on a single car trailer. Two cars on a single trailer was accomplished by tack welding the body buck chassis upside down on top of the rolling drivetrain chassis, piggy back style and fitting the rest of the kit anywhere in between it would fit. Mick and Dan took off across the country via the southern route and made it to the west coast in three and a half days. It was early June 1989 and Freeman secured space in a shop where the drive chassis and the body were set up. Within 3 days the chassis was skinned in wood and the clay was being applied. Local clay modelers were brought in and it took 40 days to get the shape reasonably refined. The toughest part of this exercise was to keep Freeman and the modelers to stick with the locked concept drawing. Now heading into August, the facility, the work was being done in lost their lease… to top this, Freeman got a “can’t refuse it” job offer and left for Germany and Mick Murphy had to return to Ireland. During this time Dan designed the Panoz Logo. It was a classic elliptic shield with an Irish Shamrock right in the middle, with red white and blue wings radiating off in a yin and yang fashion. The shamrock at the center represented the roots of the project and also in honor of Dan’s Irish wife Melanie. The Red White and Blue for the USA of course, all topped with Panoz in script. Dan, secured another 1200 sq. ft. facility and with the remaining modelers had to move the rolling clay body buck, which now weighed 3,700lbs, and had to move the delicate and entirely melt-able model from Irvine to the new facility in Laguna Hills about 15 miles away in about 100-degree heat. This place did not have a surface plate or a measuring gantry, so the crew had to hand build one, out of mahogany which was milled true and straight that could take the weight and was temperature stable. The facility cost as much as the hotel budget and the hotel discouraged Dan from trying to put the project in the room. So, Dan moved in with the car in Laguna. With everything in place, everyone got back to work. One side was then finished in detail completely. Body templates were made front to rear every 4 inches then used the gantry and hand measuring system to duplicate the finished model side all to the other side of the car. This painstaking process took over three months. More months were spent making a full-size body mold and two heavy duty examples of the body were pulled from the mold. It cannot be said enough how talented and capable the modeling crew were. One very heavy body went to Superform USA along with the master body mold in order to produce production tooling for the body which was to be created in Aluminum Alloy. After a stint at Superform to go over body cuts and tooling details, the entire body system was worked out so that most of it could be produced on only three huge tools. Two other smaller tools accompanied the big tools for the deck-lid and the nose top panel and rear valance. Superform was remarkable. The tooling would take about 7 months to produce first articles. The other body would return with the drivetrain chassis to GA to create a running driving prototype. It was December 1989 – almost a whole year. Dan loaded up the drivetrain chassis which now had a body stretched around it with all the other equipment back on to the trusty single car trailer. The body buck had done its job and was cut up and disposed. Dan enlisted the help of a buddy and headed back to Georgia. The fully operational prototype was publicly debuted 6 months later on July 27, 1990 (see picture) in attendance were many of the people who helped bring this to project life. Several orders were taken that day with the first 3 vehicles going to Mr. Ray Beaupre. 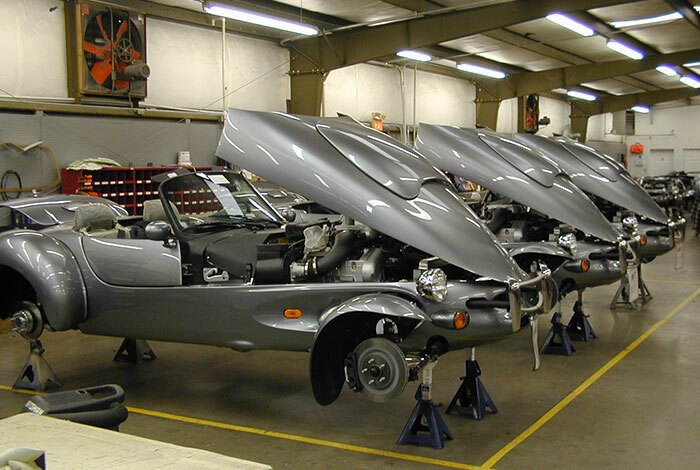 After production bodies were available and countless refinements and development, with the production of the chassis executed in stainless steel, Panoz began building “Panoz Roadsters” to order, but at first only under the regulatory definition as a component vehicle through 1991. Dan was already working toward having the Panoz fully certified for the US market. A certified vehicle followed in 1992. Well received by the press, the Roadster found its niche as a purest open sportscar. The early Panoz Roadster featured a tonneau cover but no top, it was offered as a manual 5-speed only and was equipped with a minimal heater/defrost and wipers. It was designed for pure driving enjoyment. The sound of the Ford V8 5.0L would drown out the sound of the radio and the adrenaline rush from driving would keep you from feeling too hot or too cold. 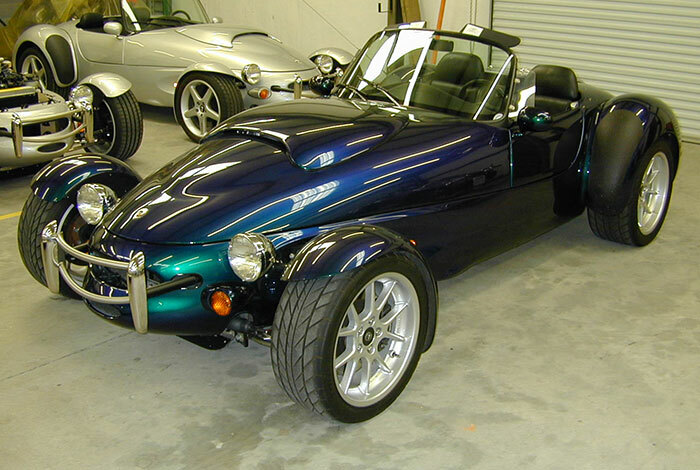 The Panoz Roadster’s performance in acceleration/braking and cornering was in the supercar league of its day. It was serviceable, reliable and could take a lot of abuse. Reliability Value Performance wasn’t just a slogan, now it stood for something. These first generation Panoz Roadsters were built until 1995 and in that period – 44 were produced and sold. In general, all cars were pretty similar, it was only the color and custom extras for each owner that differentiated them. 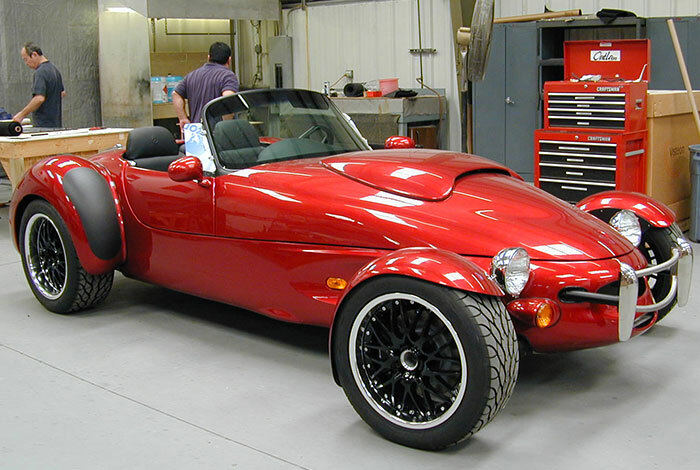 Starting in 1994 Panoz started to develop the next generation Roadster. Featuring an aluminum chassis via an extruded aluminum space frame with a central backbone as well as a new drive-train (the 1996 Mustang SVT Cobra all-aluminum V8 4.6L which had a 100bhp increase over previous roadster model). It featured an increased wheelbase, a wider track with new independent suspension all the way around, bigger brakes, wheels and tires and a roomier enlarged interior with air conditioning and a soft top, all standard. The car enjoys the distinction of America’s first Aluminum Intensive Vehicle (AIV). 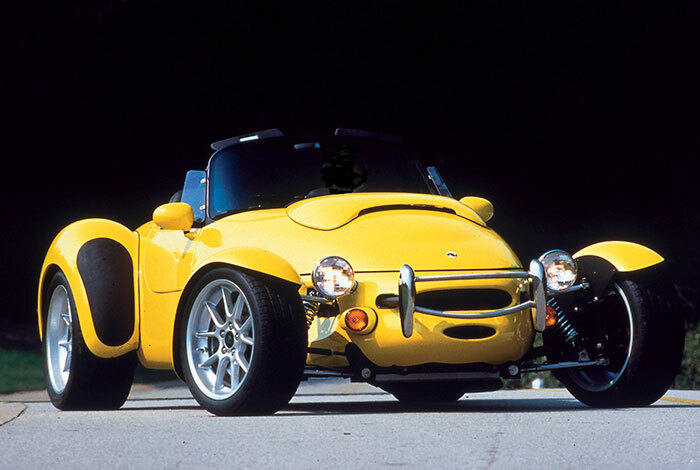 In 1996 Panoz launched the new AIV Roadster. 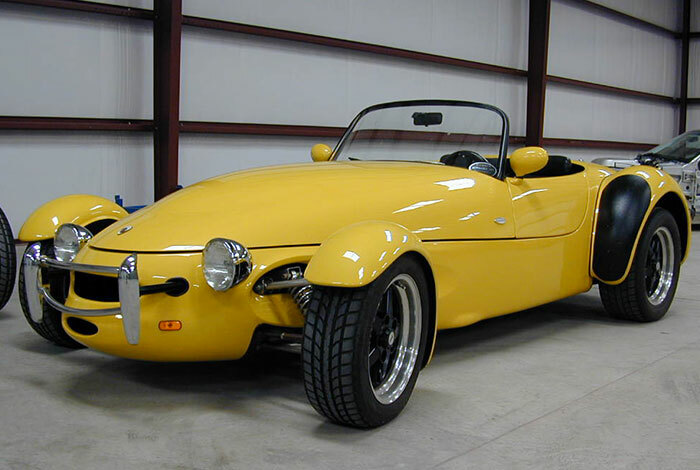 The AIV Roadster was built until 1999 with the last ten produced were the Signature Edition 2000 Panoz AIV Roadster. In total, 176 AIV Roadsters were produced and sold. Second-hand roadsters and AIV roadsters can still occasionally be found for sale and Panoz LLC is happy to facilitate connections between existing owners and new customers. Dan, Don and Panoz the company, still own a couple and at least one example of the Roadster can always be found on display in the showroom at the Panoz Museum located in Hoschton, GA adjacent to the Panoz factory where the team still regularly service the cars for customers.